Twitter may be a powerful lead generation tool on its own, but when paired with an effective LinkedIn social selling program, it becomes so much more. Not many social selling experts are discussing ways to tie in your Twitter efforts to your LinkedIn social selling program. Though there are hundreds of articles about using Twitter for lead generation, relationship building and prospecting, most never address how to use Twitter to support a LinkedIn social selling program. Let’s discuss crafting your Twitter strategy and how it differs from what the majority of social sellers or Twitter experts teach you to do. Why do you need to use both channels? LinkedIn Sales Navigator may be one of the most powerful tools for sales and marketing professionals, but it’s limited to the LinkedIn platform. If you keep your social channels completely separate, you may be missing out on opportunities to connect with your prospects on a deeper level. Because Twitter is a bit more casual and newsy than LinkedIn, you’ll be able to discover more of your prospect’s personality and communication style by following them on Twitter. Engaging with your prospects on both channels will also keep you top of mind, instead of being just another follower or “guru” hoping to sell them something. Instead, you have the opportunity to develop a more personal connection with them. Twitter is like a hybrid between LinkedIn and Facebook. It can be used in a professional sense, like LinkedIn, but its tone can be more informal and chatty, like Facebook without the over-sharing and personal drama. Okay, you know you need to use Twitter to connect with prospects, but how? 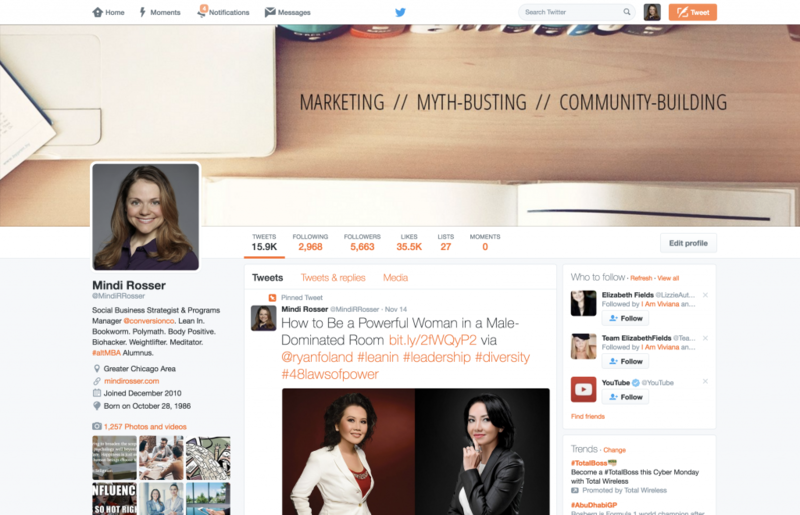 How does a standalone Twitter strategy differ from an integrated social selling strategy? If you are using Twitter as a standalone platform, there are a number of systems and strategies you can use to track your efforts. But when you choose to link your LinkedIn and Twitter programs, you will need to invest some time up front to determine exactly what you hope to achieve from Twitter activity and how that will support your LinkedIn program. It should not be the other way around. Prioritize your results on LinkedIn as a result of Twitter activity rather than unadulterated Twitter metrics. Yes, it’s good to have a healthy number of followers, impressions, clicks, retweets, website traffic, and likes, but they are not the priority. Using Twitter as another way to nurture relationships you are building on LinkedIn trumps all those metrics combined. Yes, really. Those who begin using Twitter with this intention may (or may not) see the most impressive metrics when they run their weekly Twitter analytics, but they are able to see beyond the superficial vanity metrics and focus on what really counts: nurturing relationships with prospects. Base your Twitter strategy on the relationships you’d like to build with your high-priority prospects on LinkedIn. Try getting inside their skin to figure out what they’d want to see on your Twitter profile and how they’d prefer to interact with you on Twitter. Use that as your guideline. How do you link the two of them together? Most of us have tried using a social CRM to pull in our prospect’s multiple social media accounts, but it’s just not enough. Building your own customizable CRM on a platform like TrackVia, (our database of choice) is one way to ensure you are collecting only the data points and interactions that matter most. Searching for a plug-and-play app? We’ve also used Nimble to track interactions, though it does lack a few capabilities we built into our own system. Whichever tool you do use, be sure you have a clear view of your LinkedIn and Twitter interactions with each prospect. It’s crucial to see a snapshot of all your team’s communication. What steps do you need to take to get started with your social selling Twitter program? Now, it’s time to create a step-by-step Twitter plan to implement your social selling strategy. This plan assumes you already have a Twitter account. If not, what are you waiting for? You need to look at your Twitter account to determine whether it’s a good fit for your prospect. When a prospect visits your profile page, will they want to engage with you? Does your bio speak their language? Do you need to tweet more often and on certain topics? These are a few questions you will need to answer in your Twitter assessment. Then, make those changes to your Twitter account before moving on to the next step. Before you start tweeting, you need to start listening. Follow topics on Twitter that are of interest to your prospect. My favorite monitoring tool is Tweetdeck. Using this tool, you can set up various streams to follow based on popular hashtags, Twitter lists, trending topics and search queries. If you only read the tweets on your Twitter home page, you are missing out on a lot of great conversations happening. It does take time to master social listening, so start by following a few hashtags and creating even one Twitter list. These two actions alone will help you get into the habit of social listening. Now that you have done some social listening, you will know which types of content resonate most with your prospects. That’s the type of content you should be sharing on a regular basis, both one-on-one with potential prospects and also to all your Twitter followers. This demonstrates your expertise and gives prospects a reason to interact with you. 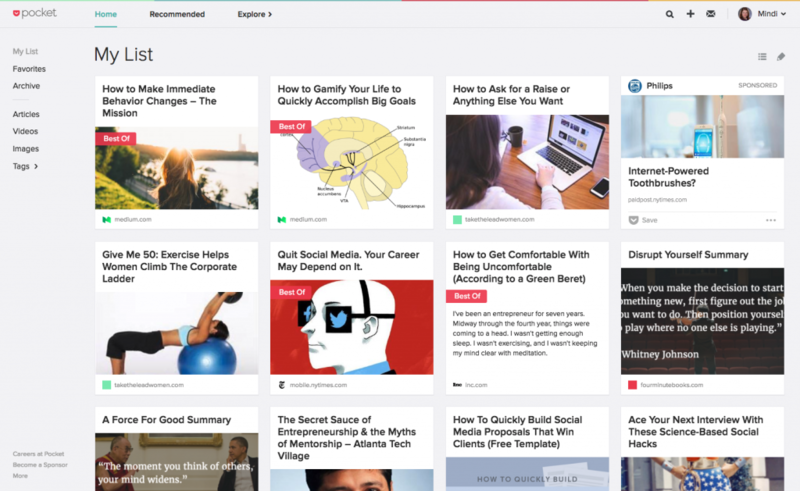 Start curating content in a tool like Pocket (my personal favorite) or Feedly. You will be using this stash when you start scheduling tweets. If you are like most Twitter users, you accumulate followers that you no longer care about following. It’s time to do a massive cleanup, but it shouldn’t take you several afternoons unless you care to analyze every person you’re following one-by-one. Though it is a best practice to review new followers weekly, you do not need to get that picky at the beginning. Use a follower management tool to clean up your followers. Simply unfollow everyone who’s not following you back. Then, unfollow inactive accounts. If you still want to go through the rest one-by-one, go for it. 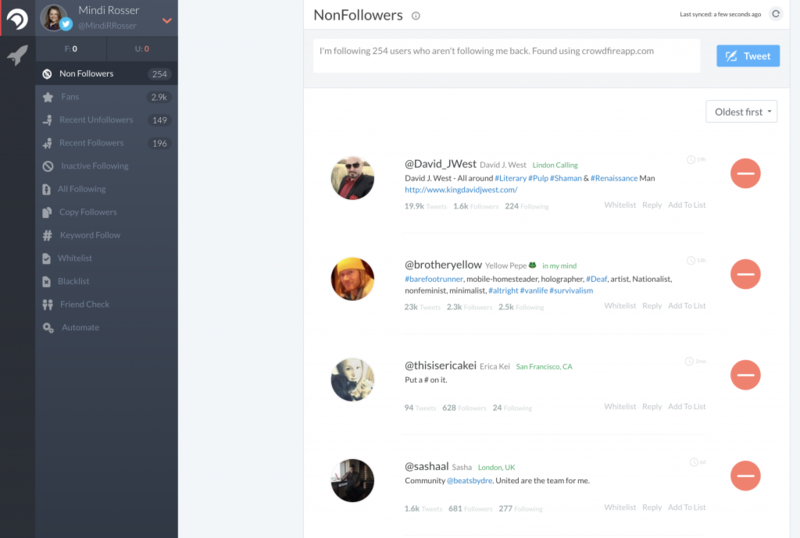 I’d use a free tool, like ManageFlitter, though I like Crowdfire best for ongoing followers/following management. It’s time to create a few Twitter lists for your prospects. 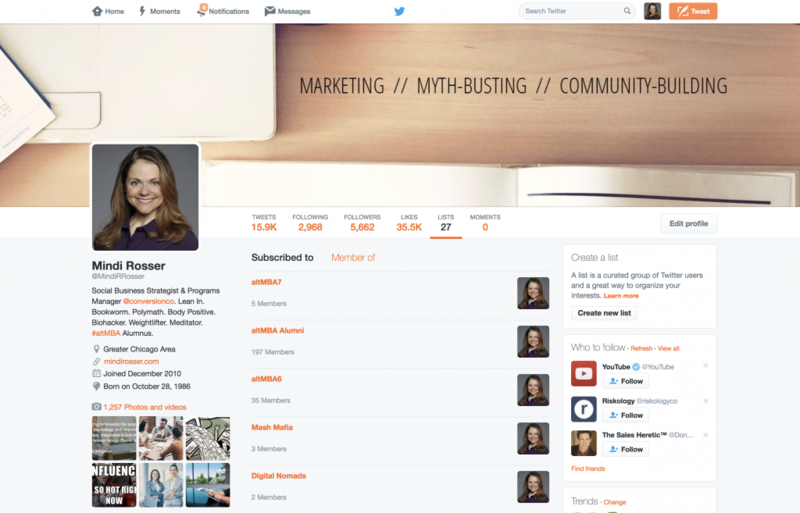 I would base these Twitter lists on your chosen target markets, industries or personas. You will be adding each of your prospects to one of these lists and monitoring them. The goal is to use these lists to help you easily and authentically engage with relevant tweets. Once you create these Twitter lists, add them to your monitoring dashboard (i.e. 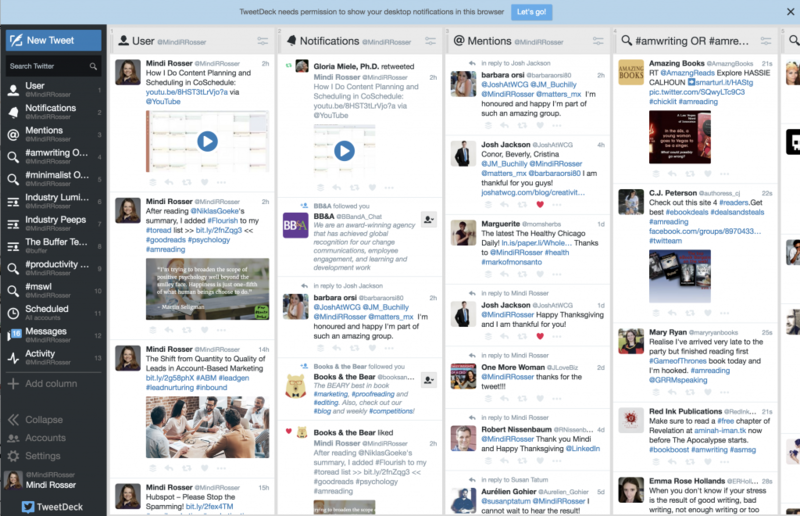 Tweetdeck or Hootsuite). These will become the main streams you monitor. Reference your content stash to create tweets to share on Twitter. Aim to schedule one to three tweets per day, though you can share more if you have the time and inclination. These tweets should be written in the language your prospects use because your goal is to connect with them. Use a tool like Hootsuite or Buffer to schedule your tweets at least 24 hours in advance, though it helps to batch schedule them one week in advance. Now that your systems are all set up, you might spend as little as 10-15 minutes per day managing your Twitter account, though you will achieve better results with a bit more time. You can even skip weekends if you don’t mind a bit of Monday catch-up. Checking in first thing in the morning is one way to get into the habit. Follow a Twitter checklist at the beginning to be sure you don’t get distracted by trending news or hashtags. You will do most of your management tasks in Twitter itself and in Tweetdeck (or your social monitoring dashboard of choice). Any information from Twitter that needs to be manually recorded in your social CRM should be done at this time. At least once a week, you should actively spend time following potential prospects. One way to get started is to go through your database of LinkedIn contacts and check whether they have a Twitter profile. Follow them on Twitter and add them to a Twitter list. Be sure you also note their Twitter handle in your social CRM next to their LinkedIn profile. Add in any comments, interactions or notes at this time. Measure the KPIs that matter most to you. For some, it’s lead generation. For others, it’s getting a phone call with a potential prospect. You will need to determine what these KPIs are for your business and monitor them weekly/monthly/quarterly. Figure out which actions on Twitter and LinkedIn are driving these results. Experiment. Try new approaches. The metrics will show you where to invest more time and which activities are not worth the effort. Focus only on the activities that drive the most ROI, and don’t waste time doing anything that is not driving results for your social selling program. Refine your approach accordingly. Social media activities might seem intimidating to the uninitiated, but you can execute a solid plan with some basic research and a shortlist of activities you can do every day. With a little time to adjust, you can turn even half an hour into a truly effective social program. Mindi Rosser is a social media strategist for hire, who specializes in helping brands, businesses and people look great online. As a digital native, she has spent nearly a decade working with B2B and B2C companies on developing and implementing strategic marketing programs. She also consults for The Conversion Company, an online marketing firm helping B2B companies and executives use social media to drive dramatic business results. 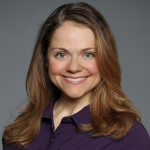 Connect with Mindi on LinkedIn or tweet her (@mindirrosser) to chat about all things B2B marketing, social selling, employee advocacy and social media.